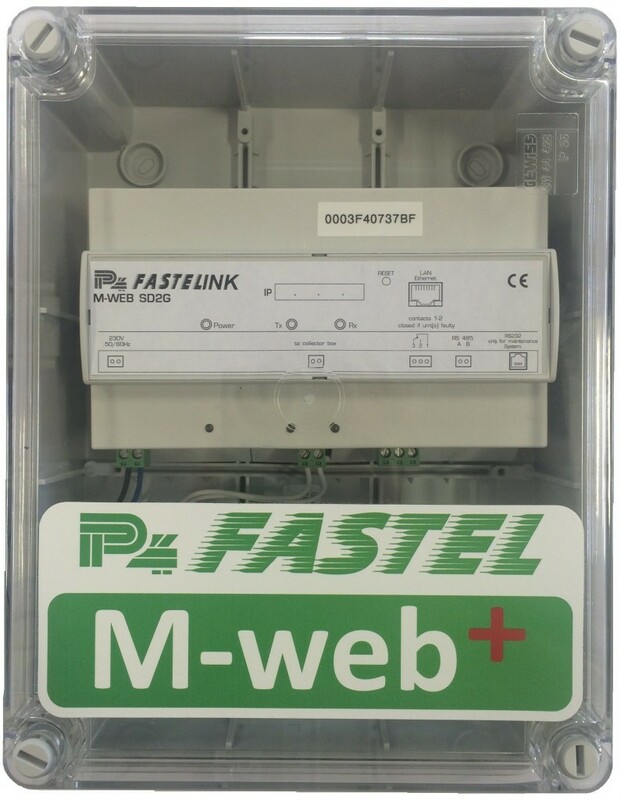 M-web features an Ethernet interface with integrated web-server and supervision unit for P4’s FASTELink Emergency Lighting Systems. Connection is possible to any LAN Network via a TCP-IP protocol. The unit’s interface can be connected directly to a maximum of 125 FASTELink emergency lighting luminaires; by adding collector boxes the system’s capability can be expanded to monitor up to 7,875 FASTELink emergency lighting luminaires. M-web is used as a central supervision unit in the system and continuously scans the whole installation, gathering information about all of the emergency luminaires. When addressed by Web-Navigator software such as Internet – Explorer, M-web can transmit all of the information it has gathered from the emergency lighting units. This information is transmitted as HTML pages which are displayed by the navigator software. Using the same software, it is also possible to change the configuration of the M-web unit or of each emergency lighting unit. The M-web unit incorporates an email facility which can periodically send current status information to the end user. Suitable Location In riser, cupboard or location protected from unauthorized access. Network Cable Min. 2 x 1.5mm² conductors mains rated cable.